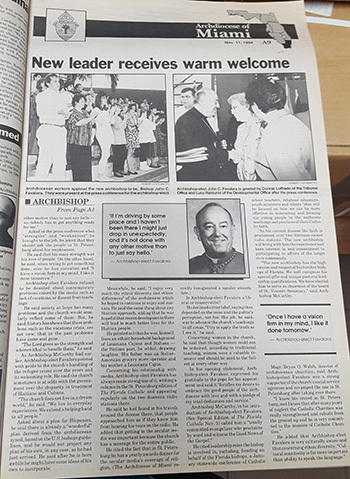 Religious of the Sacred Heart accept Bishop Coleman Carroll’s invitation to open a school for girls in the diocese (now known as Carrollton). Classes will begin in January 1962 on a 10-acre estate in Coconut Grove known as El Jardin (the garden), which fronts Main Highway and overlooks Biscayne Bay. The site comes with an Olympic-size swimming pool and a 35-room residence. Nov. 22: More than 20,000 volunteers fan out across South Florida, calling on individual homes, to find out how many Catholics are living in the 16 counties that make up the Diocese of Miami. 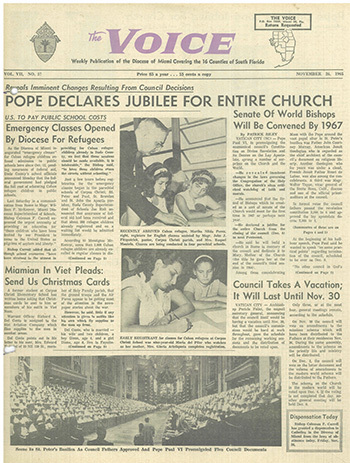 The last census, carried out in 1960, found a total Catholic population of 331,668. A new Haitian Center named for St. Joseph is dedicated in Pompano Beach. Archbishop Edward McCarthy and other Christian leaders issue a six-page pastoral letter, distributed throughout the state, calling for an end to capital punishment. Black Catholics organize the St. Martin de Porres Association. Camillus House marks its 30th anniversary by announcing plans for a new shelter aimed not just at meeting the desperate daily needs of the homeless, but at helping them re-incorporate themselves into society. The planned shelter would provide meals for as many as 250 people, offer semi-permanent housing for 88 men and house a medical clinic capable of treating 100 persons. The $2.3 million facility will be built on Miami Avenue, between N.W. 18th and 19th Streets, if the City of Miami approves the zoning and agrees on a price for the land where Camillus House currently sits. Nov. 3: Bishop John C. Favalora of St. Petersburg, a native of New Orleans and former bishop of Alexandria, Louisiana, is appointed to succeed retiring Archbishop Edward A. McCarthy as third archbishop of Miami. 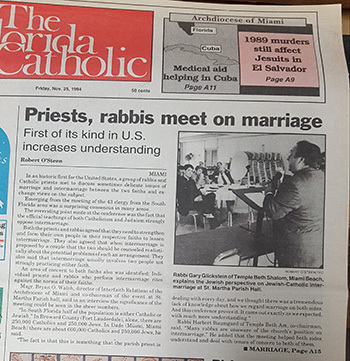 For the first time in the history of the United States, Catholic priests and Jewish rabbis meet to discuss the delicate issue of inter-marriage.During the meeting, held at the Pastoral Center, the two groups find common ground in both their religions’ opposition to the practice. 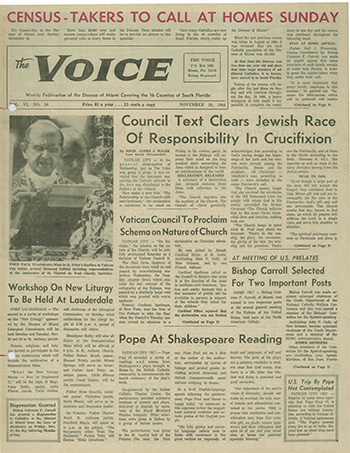 The conference was organized by the Connecticut-based Center for Christian-Jewish Understanding. Catholic Community Services, Broward County, moves into new central offices at 1505 N.E. 26 St., Wilton Manors. The 6,000-square-foot facility, which cost $300,000 to purchase and $300,000 to renovate, will house all of CCS’ offices in one place. Catholic Community Services changes its name to Catholic Charities,“to more clearly demonstrate our affiliation with our sister agencies in other dioceses across the country and with our national office,” said Auxiliary Bishop Thomas Wenski, president and secretary of the board of the agency. 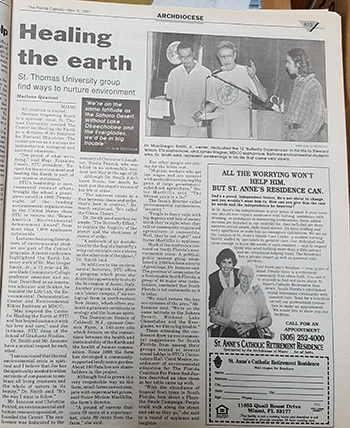 St. Thomas University sponsors a conference on environmental issues to highlight the fact that all creation is sacred and human beings need to nurture and protect the environment, in particular the eco-system of South Florida. 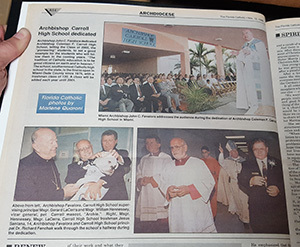 In ceremonies two weeks apart, Archbishop John C. Favalora dedicates the archdiocese’s two new high schools, Archbishop Edward McCarthy in Broward and Archbishop Coleman Carroll in Miami-Dade. 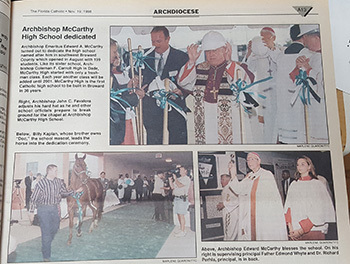 In attendance at the ceremonies are the mascots for each school: a bulldog for Carroll High and a horse for McCarthy High (Mavericks); as well as Archbishop McCarthy himself, who blesses the new building at his namesake high school. 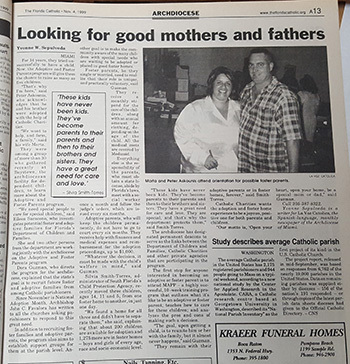 Catholic Charities teams up with Florida’s Department of Children and Families to recruit foster and adoptive parents from among Catholic parishioners in South Florida. The goal is to reduce the backlog of needy children who linger in foster care by finding good homes where they can rebuild their lives. 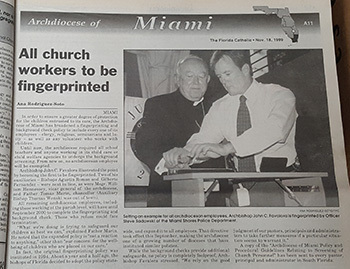 Archbishop Favalora and his auxiliary bishops become the first to be fingerprinted under a new policy that requires background checks of all archdiocesan employees, including priests, deacons, religious and volunteers. 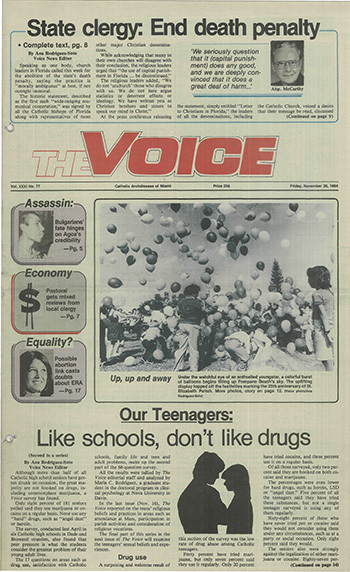 The statewide program was approved in 1998 by the Catholic bishops of Florida. Nov. 23: Msgr. 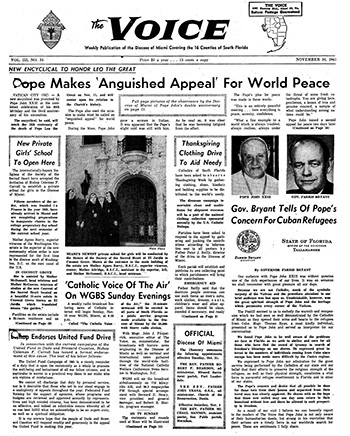 Felipe de Jesús Estevez, former pastor of St. Agatha Church in Miami (1987-2001) and spiritual director at St. Vincent de Paul Regional Seminary in Boynton Beach, is appointed the eighth auxiliary bishop of Miami, becoming the fourth Cuban to be appointed bishop in the United States in modern times. 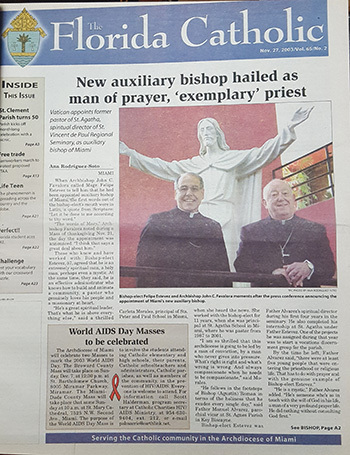 His ordination ceremony takes place Jan. 7, 2004, at St. Mary Cathedral.